This August 16-19, La Leona Lodge organized a workshop about frugivorous (that means fruit-eating) butterflies with entomologist and curator of Lepidoptera, José Montero of INBio (National Biodiversity Institute of Costa Rica). This workshop was attended by several people in the area, including naturalist guides and employees of La Leona Lodge. José taught us about the methodology that he has been using in different parts of the country with great success for several years and now La Leona Lodge has begun to use, in order to generate information about butterflies of the Osa Peninsula. 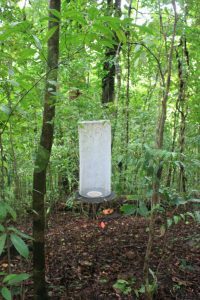 The methodology used by José consists of traps that are placed in the canopy and the understory that attract butterflies with fermented fruit. 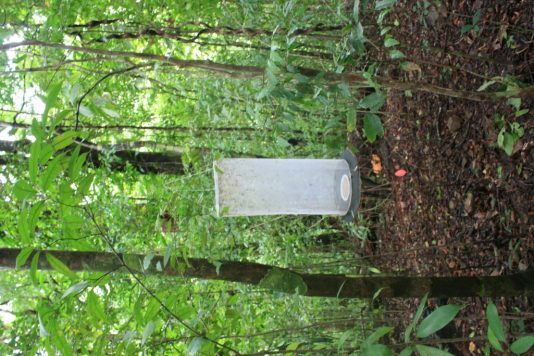 Fruit is placed in these traps during the first week of each month. All butterflies captured during this period are identified, which gives a pretty good idea of the species richness in both strata of the forest, if sampling is performed at adequate intervals. Jose shared with us some of his vast knowledge of frugivorous butterflies of Costa Rica, which, he tells us, make up between 40-50% of all Costa Rican butterfly species. He also told us how the species richness of frugivorous butterflies has greater variation vertically than horizontally; i.e. there is a greater difference between the canopy and the understory of the same site, than there is between different sites at similar heights. Not content to talk only about butterflies, José also gave excellent lectures on the concepts of diversity, evenness, dominance and beta and gamma biodiversity, all fundamental concepts in the work he has been doing. I would like to thank La Leona Lodge, especially Ifigenia Garita, for the opportunity to have participated in this activity. I also want to thank José Montero his great willingness to teach and share his knowledge.